I have worked in publishing for most of my career, which has involved travelling many times to America, and Europe and the good side to this is the space to listen to film scores. This I have been doing since I can remember. My parents were music lovers with some eclectic tastes including opera, which my mum sang along to beautifully. There was always a radio on plus a good stack of LP’s to rifle through. There were 2 significant times that began my love affair with screen music. When I was 10 I sat at the top of the stairs to listen to a TV theme to a show I was too young to watch. It was called The Human Jungle, still a fantastic theme even now, composed by Bernard Ebbinghouse, and played by The John Barry Orchestra. Little did I know that this would start a lifetime passion for the music of John Barry. 18 came along and by then I was going to the ‘flix’ two times a week [and having to show my birth certificate to get into ‘x’ rated films], my second epiphany came with Lalo Schifrin’s now iconic score to Bullitt. Not only did I think that Steve McQueen was a real cop, but how could what is essentially a jazz score fit so perfectly for such a sparse and realistic crime thriller? This also started my life long love of jazz soundtracks. Oh, the agony I had waiting for three long months for the imported LP soundtrack to come over from the States via Boots! Yes, Boots sold LP’s once upon a time! How did you begin your radio show? Tell us a little about its history, and what you do now in terms of film music journalism. I have always loved radio and always wanted to work in it. I have been in hospital radio for 23 years. Hospital radio is a great platform to get your radio experience and started many professional broadcasters on their way. It’s now very sophisticated and has kept up with technology as many stations, including ours, now stream their output. Then for 21 years I was the Station Manager, and am now Production Manager. I cut my teeth on presenting film music shows here. I listen a lot to internet radio and loved the weird and wonderful eccentricity of Radio Nowhere, which started in 2002. I sent in a demo and the producer Christopher Laird asked me to ‘add another 10 minutes onto your demo and this will be your first show’. My show, Filmic, is in it’s sixth year. I play music from new and old soundtracks. Dedicated film music radio is one of the best ways to promote new and re-released soundtracks together with vintage material, because you are sharing film music that is now available to all and hopefully at the same time encouraging others to learn about and love this genre. 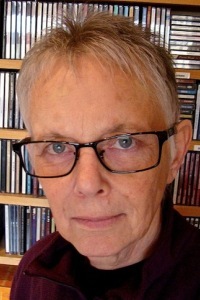 I also review soundtracks and upload composer interviews at www.filmic.blog.co.uk [new blog currently under construction]. Reviewing really gets you under the skin of a score. I guess it’s easy to say that it has to enhance the film and create it’s mood, but it’s true. Luckily I have a wide taste in soundtrack styles so I do listen to everything I can. Some of the time I haven’t seen the actual film I am listening to, but this has power in it’s way, it creates a mood picture and you go from there. There is also lot of creativity around at the moment; I love Johann Johannsson’s minimalist score for Prisoners. It’s sparse but there is so much conveyed. And could you imagine any other score than Alexandre Desplat’s, which is perfect for the strange world of The Grand Budapest Hotel? I think, as a broadcaster and reviewer, we have to stretch ourselves to appreciate the diverse world of film music which is out there. I think over the last few years it’s expanded. Scores usually have a thematic element that you could follow, characters cue’s, which guide you. Now we have soundscapes, which tap in to the essence of a film, and in fact two of my favourite scores of 2014 were the strangeness of Mica Levi’s Under The Skin and the leanness of Gary Yershon’s Mr Turner. I find the choices we have now very exciting. What is your opinion of the film music industry as it stands today. I guess I have answered it above. With changing styles it opens the field for new composers. If the big studios worked more in tandem with composers rather than demand that it sounds the same as the last film they financed or following the current ‘sound’, we would hear some soundtrack gems I am sure. One thing the industry is – it’s more accessible. Apart from all the social media you can pick up, the composers themselves are accessible and that is a boon. Well, I am doing this backwards as I have to start with my influences when young, so 60’s and 70’s soundtracks hold a special place. As mentioned before, John Barry has unique melodies, which he tops with immaculate and superb orchestration. He kind of built the cool 60’s sound. The cool was also helped along by Jerry Goldsmith’s Flint scores. The 70’s were created for me by the likes of Roy Budd and Get Carter and Fear Is The Key. Composers of the 60’s and 70’s seemed to compose for what was happening at the time. When I really started to explore movie music I seem to move towards the big soundtracks of Rozsa, Steiner, Waxman and Bernstein and especially Bernard Herrrmann. The giants whom influenced many a composer. They were the game changers for sure. As I have a wide taste it’s difficult to pinpoint what appeals to me – perhaps the test is listening more than once to a score or always having a cue which hits the spot on constant play. Certainly at the present time Alexandre Desplat [who is so versatile in his scoring], Clint Mansell, Hans Zimmer, Phillipe Rombi, Jonny Greenwood, and I have to add The Newton Brothers, are building up my soundtrack collection. Listen to Ley’s radio show, Filmic, at Radio Nowhere, read her work at Filmic, and follow her on Twitter at @FilmicRadio.